Two vehicles - for land and ice - powered only by wind. The Greenbird is two vehicles: a land craft and an ice craft, powered only by the wind. The project's aim is to break both the land and ice world speed records. 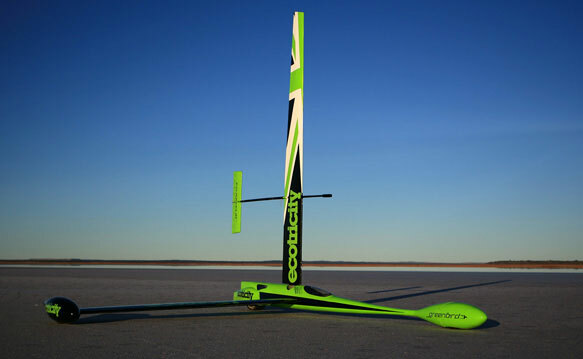 On March 26, 2009, the Ecotricity Greenbird set a new world land speed record for wind powered vehicles of 126.2 mph. The team hopes to both better that new record, and continue to work toward breaking the ice record in Winter 2009/10. The crafts are elegant, sophisticated and futuristic - but are based on familiar aeronautical, sailing and wind technology principles. They use solid sails, much like an aircraft wing. The crafts' design achieves staggering efficiency. It enables the land craft to travel at between 3 & 5 times the real wind speed, depending on the surface traction. More on the craft & how it works. Receive updates on our world record attempts.